The annual Stoney Lonesome Barbie Jeep Race event that goes down at Stoney lonesome OHV park in Bremen, Alabama always makes for a good show. 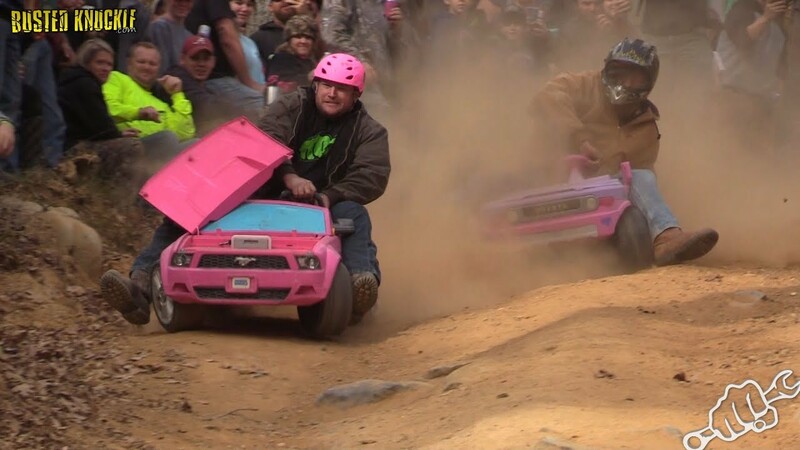 Downhill barbie Jeep Racing or Extreme Barbie Jeep racing as we call it has long been a crowd favorite among our viewers and one of my favorite sources of adrenaline. Coming off the 2017 Championship win I decided to throw my hat in the ring to see if I could win $200 and a trophy. I dusted off my Gator and readied myself for some tough competition. You might be asking yourself who in their right mind would want to go power wheels racing downhill? Well we had 9 crazies sign up including a 60 yr old man from Oregon. The folks over the race groomed the hill with a nice little jump in the middle. It wasn’t a crazy fast hill but had the possibility for some good carnage. Knowing that no push off was allowed at the start I knew that I would have to work for it. I was in the first group of 3 in the double elimination format. They said go and we jumped off the start line to get gravity to do it’s thing. It was a close race but I got a good feel for the course and crossed the finish line in the lead. The losers bracket then ran again before the 3 winners faced off. This time I used tricks to get a lead and finished ahead of the others. After a few more races it was down to the final 5. Everyone had a loss except me. We took off and one of the quads got the jump on me. I pulled up on the steering wheel and had the front tires off the ground a few times to try to gain momentum. It worked as I crossed the finish line in first place taking the win, the $200, and the awesome Barbie Jeep Race Stoney Lonesome Trophy. Can’t get Enough Barbie Jeep Racing? Click the image below to watch the 2017 Championships.